The Grinch would have a real job stealing all the Christmas from Hyde Park's massive tribute to festive fun, which is back for an twelfth year in 2018. 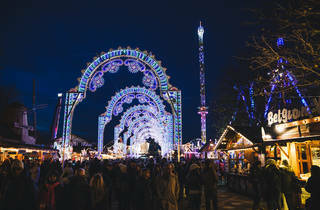 Entry to Winter Wonderland is free, and a wander past the fairground rides, around child-friendly Santa Land (including Santa's grotto) or through the Christmas markets is a real treat for anyone feeling the spirit of the season, as long as you're ready to hear all those songs as you potter. 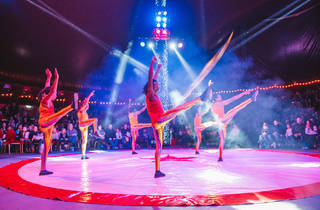 Other attractions at Hyde Park's annual sparkly Christmassy addition include two circuses – ' Zippos Christmas Circus' and 'Cirque Berserk'. 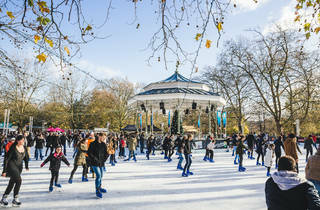 Winter Wonderland's ice rink, the biggest outdoor rink in the UK, surrounds the Victorian bandstand and is illuminated with more than 100,000 lights. There's also the Winter Wonderland Comedy Club, ice sculpting workshops and immersive screenings of ‘The Snowman’. This year the Magical Ice Kingdom presents an 'Enchanted Forest' - an immersive walk through experience filled with ice and snow sculptures. Along with the 60-metre observation wheel, rollercoasters and fairground rides will keep thrill seekers happy. A good alternative for those who prefer to stay on solid ground are the selection of themed bars with real fires, except for the Ice Bar (for obvious structural reasons) where even the glasses you drink from are made of ice. If you're skating, be aware that while there's no minimum age for skaters, under-12s must be accompanied by someone 16 or over and the smallest skates for hire are children's size 9 (adult skates go up to size 13). You can use your own skates as long as they're not speed skates. Wheelchair users are welcome on the ice. There are also ice guides who can look after groups of up to 15 skaters at a time (for an additional charge). I have been to Winter Wonderland for the past 4 years and overall it is getting bigger and better every year. Lots of rides for young and scary big ones for the brave. A great market with a variety stalls full of goodies and lots to look at as you walk around. Overall the atmosphere is brilliant, considering how many people there are we hardly noticed or heard any people moaning. My only, and biggest, complaint is the price. On average rides cost from £3 to £8 (you have to buy tokens £1 = 1 token), if you have a child an adult must go on the ride/fun house with them, so in reality this doubles the cost... there are also lots of carnival type games (you know the type, throw a ball into a ring and win a teddy...) which you pay for at around £3-5 per go so even if you have budgeted by buying a certain amount of tokens you get caught out with these random extra cash stalls! With my 5 year old we spent £50 today..Ek! Then is add salt to the wound the cost of the food is ridiculous. 1 portion of chips in one of the indoor food halls cost £3, I counted the chips – 20 tiny stumpy fries for 3 quid! I would strongly recommend to anyone – BRING A PACK LUNCH!! Though I would also recommend treating yourself to a mulled wine – yum. If you intend to go on the weekend I would strongly advise that you get there early; we arrived at 11am today (Sunday 7th Dec) and walked straight in. We noticed that by lunchtime there was a massive queue outside. Then when we left at around 5pm the queue was around the corner. I’d estimate a minimum of an hour wait if not 2! Crazy!! Also if you have youngsters and want to see Santa head there first, and get an adult to join the line! We went around 2pm and after 20 minutes reached the 2 hour notice board! Suffice to say we left the line at this point. We will be going again next year, with packed lunch, bag of marsh mellows and a strict budget. With a Christmas wish that the organisers have done something about the rip off prices. BIGGEST rip off, rip off, rip off EVER your worse than banks Shame on you. A lot of the reviews on here just seem to be promotional advertising. Anyway it's good fun if you are wealthy. What a rip off, you can find less of the same at any circus / tat market. Food was poor at two stalls we tried and circus was less than average. Well I wouldn't reccomend... It's a trap! Expense after expense to fleece what can possibly be fleeced from a parent. We paid in advance for the Ice Kingdom... good stuff but small for the cost, the circus was a bog standard affair I've been to a few different ones for a third of the price, no better I'm sorry to say and all for a 45 minute show. All prices are pretty much the same: small portions of fries £3, plain hot dog £5, 4 the prices may go up in places after 6pm. As mentioned below, take food and drink. Parking in the car park nearby is somewhat pricey at £22 for a 3.5 hour visit. - BE PATIENT, you will need to queue to get on the fun rides! My suggestion if you must go: meet with friends, have a tour and get a drink at the Fire Pit to get some winter atmosphere and don't stay too long! While Winter Wonderland is an annual iconic London event many people get excited about, I am not a big fan. It is overcrowded and overpriced, the stalls are tacky and not authentic. The only time there is a chance of me setting foot in it is at quiet times during the week for a German Bratwurst (which is average). what an absolute rip-off all the children's rides were. it's just a glorified market with lots of tacky stalls. £3 for one go on the helter skelter which last all of 10 seconds, or £9 for three people to go on a small children's ride. i certainly won't be going back. I know there are a lot of mixed emotions about Winter Wonderland. We went for the first time in 2016 and skipped last year and decided we'll give it another go this year. And, I'm glad to report that we did. The Winter Wonderland has got a lot bigger with more stalls for nick-knacks and a bigger food offering as well. Yes it is busy, but it's the festive period and it's London, so that's to be expected. While it still does not compare to any other European Christmas markets, I was pleasantly surprised with Winter Wonderland and will now make it an annual event. brilliant as ever, but very busy. This place is magical and has something for everyone. It's free to explore and enter. Rides and certain shows do cost extra, in typical theme park style there's everything from rollercoaster to bumper cars. There's endless food and drink stalls and a German style Bavarian village that plays Christmas songs and party favourites together with indoor seating for drinking. Veggie stalls are also available and there's lots of sweet treats. Top tips to surviving Winter Wonderland. Firstly go on a Monday or Tuesday during the day or before 6pm as once you're through bag searches the lines aren't bad at all. Secondly, have cash on you... do not use the ATM as they charge a small fortune and not all food vendors have card machines. Thirdly, take a small bag or no bag at all. By keeping things close to you, you won't have to worry about pick-pocketers. Final word of advice- enjoy your time there and take it slow 2018 have a new layout and some exciting shows. I loved my time at Winter Wonderland this year and will be going back on its final day, Jan 6th for the family day. The Family day has no alcohol but additional activities for kids. Also there are more entrance this year so it was super easy to get in. This place gets bigger and better every year and I loved my evening spent there! However I visited on a Monday evening in late November when there were no queues to get in, less children and no waiting at the bar. I can imagine going at the weekend might be a bit more of a busy experience. Oh and the Halloumi fries stand is yummy! My least favourite thing about Christmas, I have been going every year, and this particular year, its so overpriced, overhyped and a let down! i usually go on a weekday when its less crowded as opposed to a weekend. But this year it was crazy busy, too many crowds, the drinks are so expensive and so are the rides!! The mulled wine was horrible, the food is good but just overpriced! Too much of a muddy mess for my liking to be honest! A fun day out for all, with plenty to see and do. Best visited on a weekday, and definitely avoid the closer it gets to Christmas as the crowds can be insanely busy! It's free to get in, but take plenty of pennies as the food and drinks are pricey, and the various funfair rides even more so. Absolutely love winter wonderland - I have taken everyone I know to make sure they get to experience the pure Christmas joy! It's a fun day out (though at points freezing) and perhaps a little expensive but only if you choose to spend. The food stalls are all lovely - particularly loved having currywurst and crepes! Also had a cheeky hot chocolate with baileys and amaretto at one point! Love it. Definitely head down there... maybe take a day off work and get the girls together for some festive fun! Winter wonderland does exactly what you’d expect of a Christmas takeover in Hyde Park. It’s shiny and loud, and yes it’s expensive. But, once you’ve accepted that those things aren’t going to change I find that every year I go I leave laughing with my friends with a phone full of photos of lights, food and rides. There’s honestly something for everyone. I went on a Saturday and despite the 20 minute security queue to get in, which given the current terror climate in London I was grateful for, I barely had to queue or wait around for much else in the day. The carousel bar might just be one of my favourite things about Christmas the combination of slowly spinning while two singers cover the classics with a mulled wine in hand is pretty much my perfect evening. Watching people scream their way down the hangover tower, just a small 85m tall, never gets boring. Plus, singing and dancing at the Southern Comfort Fire Pit while everyone claims it’s someone’s birthday for a shout out is such a laugh. All in all you have to go with a sense of humour about the whole thing and if you do you’re sure to have a great time. Welcome back, Winter Wonderland! Easily the biggest and best festive London outing, this has Christmas in spades. There are heaps of bars (Thor's is a welcome addition), oodles of fairground rides and loads of Christmas craft stalls (a personalised horseshoe anyone). Obviously there are downsides to the crowds - there can be huge queues so pick your visiting times carefully and I also think some of the bars and stalls are a tad on the expensive side (Santa would not be impressed!). We went on opening night this year and it's probably the first time I've had to queue to get in. It moved quite quickly though and we headed straight to the ice bar where we were given a poncho and thick gloves. The drinks were delicious but we could only stay there for 20 mins (one drink) as it was bloody freezing! This followed with 3 mulled ciders, 2 sausage dishes, 2 rides and dessert! The haunted mansion was a disappointment but I really enjoyed the loop rollercoaster which was only £3 more. All in all I spent £65 but we did spend time 5 hours there with non stop activities. I would say plan your budget and what rides you want to go on beforehand and book activities like ice skating and ice bar in advance. Years ago, when I lived in Birmingham, I came to London around Christmastime with my mum. Winter Wonderland was the most magical and beautiful experience. We had warm cider, a hotdog, wandered around and soaked in the atmosphere. A couple of years later, I went again on date night. It had an intimate charm, with open fires, steins of beer, sharable food and it was a Winter Wonderland. This year, it was overpriced and tacky. With numbers of fareground vendors, a burnt hotdog and muddy grounds, which is such a shame! 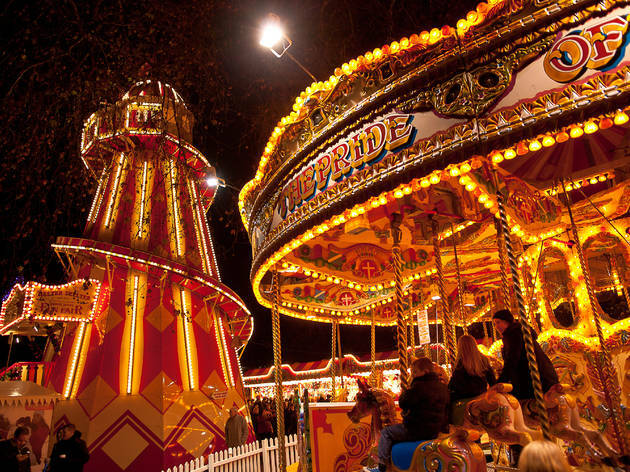 Winter Wonderland is perfect for newbies, who have never experienced the magic of a Wonderland in central London. But after a few visits, unfortunately the sparkle dulls. Whilst I would never dare go to Winter Wonderland as a parent, I do think it is a charming and iconic London Christmas outing. We knew right off the bat that food and drink would be pricey, and so we didn't plan on staying too long. It was more about taking in the bright lights and, delicious funfair food aromas. I have been to winter wonderland every year, and it has gotten more and more expensive every time. Its still really nice and lovely, but so expensive its insane ! I was very disappointed to have had to cancel my planned day to winter wonderland after my girlfriend has taken ill. The tickets for 2 attractions already cost £60 of what is to be an extremely tight Christmas. So I called to try and cancel my tickets... They say they do not offer refunds under any circumstances, and they do not allow for the resale of tickets. So I am now stuck with a £60 hole in my pocket that I am not even able to pass on to somebody else. Horrible company and I've since been told that it is overcrowded and over priced anyway, so perhaps I've avoided a bad day. That's the only positive I can take from my experience. The name says it all, it's truly a Winter Wonderland. A wonderland where your dreams possibly become clearer and where you'll relieve all your stress. Trust me it really does work. This was my first ever time visiting the Winter Wonderland in Hyde Park. One of my favourite parks to walk around ever in London. The amount of people to walk through the theme park is immensely exciting. I visited the Winter Wonderland to go and see 'The Nutcracker on Ice' spectacular at the Winter Palace Theatre. It's right at the entrance when you first come into the theme park. It's a free entry which is fabulous, but I must say the prices for the attractions and the food establishments are expensive, but at the same time you are here to have the best time of your life. Do pay attention to how much you spend. We all might think that a couple of attractions are cheaper than others, but if you add it all up it probably won't become cheap. You will find everything that you can think of from ice rinks, to rollercoasters, to haunted houses, to gigantic wheels, to exquisite theatre performances. There celebrating 10 years this year and I believe that this year is the year the whole family should visit and go bonkers. One thing that I do find quite confusing is that you firstly queue up to purchase tokens to go on the rides and then you queue up again for the attraction. I don't see why you can't just buy the price of the ride and get through. It's the same price if your buying the tokens, so no saving there to be honest. It's a place where love and excitement is spread across wherever you go. We decided to go for one of the Haunted Houses and it was quite exhilarating actually. I really don't know why I was terrified, I looked like a maniac screaming. It wasn't even that scary, I suppose it made me jump. We also experienced the extraordinary Mouse Trap styled maze and ride included. This ride I must say is definitely worth every penny. I absolutely adored the Carousel Bar, completely original. The idea of it is brilliantly executed. Be prepared to wear good boots to protect your feet from the dirt and water accumulated during your travels around the Wonderland. Experience it for yourself and go crazy at the best destination for Christmas this year. This was my 3rd Winter Wonderland at Hyde Park, and I think the best so far. Holiday spirit is everywhere, the lights, the music, the stalls. I just had a walk through, on a weeknight when it was more quiet and I enjoyed myself, it's like the big State Fairs we had in the U.S. I didn't buy anything, just looked and wandered. It is very expensive in there and very commercial, so either be prepared to spend loads for not much, or don't buy and just have a look. Winter Wonderland is an ever-changing beast, and I've had both one star and four star experiences here at different times. This review is more of a 'how to' guide, as the star rating for Winter Wonderland could change massively depending on how you approach it. Tip 1: If you go on a weekday evening in November, then your experience will be vastly different to someone who visits on a mid-December Saturday. The crowds can massively hamper your enjoyment, so try to visit at an off-peak time. Tip 2: It's much prettier and less tacky in the dark. Tip 3: If you set yourself a budget and stick to it, you'll suffer from less crippling regret. The games and rides are eye-wateringly expensive, but if you set yourself a £20 limit (or whatever's appropriate for you) you can still do a few fun things without burning a hole in your wallet. It will just mean that you prioritise your top picks rather than the first things you see. Tip 4: Don't go hungry. If you have a chance to wander the food booths first, you can suss out the good ones. They're a mixed bag! Do not be so hungry that you're about to faint, because you'll launch yourself at the first pretzel stand you see and invariably be disappointed with the quality. Tip 5: Be happy! Enjoyment of Winter Wonderland depends greatly on your mood. Only go if you want to, and don't go when cranky or hangry (see tip 4). If you're feeling anything other than sunshine and sweetness, avoid it like the plague, as soon you'll be swearing at slow walkers, cursing the trickery of the games masters and wishing that you were at home on the sofa. There you go: Tara's top tips. Go forth and enjoy! I haven’t been to Winter Wonderland for about eight years. I’ve been there twice and I felt that’s more than enough. But visiting on the occasion of the Nutcracker On Ice, it seems it evolved in the last few years. It’s still what you expect from this kind of fun fair, it’s tacky, it’s crowded (even on weekdays), there are carousels, shooting stations and lots of sweets to try. But I remember it with a very limited gastronomic options and that has improved significantly. I love the Bavarian Village most out of everything, it really has a feel of an authentic German market, so you ca forget all the kitsh around and just enjoy a currywurst with a pint of German beer in a wooden hut with live acts every night. (Almost) perfect festive season drinking destination. Every year is a must go in London at least once. Especially if your friends are visiting you in London. Getting bigger and bigger every year. Take your friends, girlfriend or boyfriend or just go by yourself. It's a lot of fun over there waiting for you. 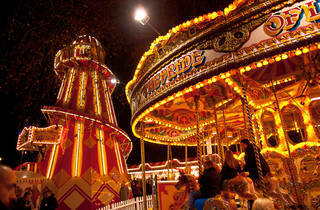 A fun gathering of stalls, rides and attractions to get everyone in the festive spirit. However, a few things really need to be sorted out - the queues are ridiculous, for food, rides, Santa, to get in!! It seems the event keeps getting bigger year on year but there is less and less space. The prices are extortionate too which makes it all less enjoyable. I would suggest the other smaller events such as Winterville, where the food is delicious and affordable and the circus was fantastic! I've never been to winter wonderland on a weekend during the day and I won't be doing it again! It was way too busy! It's changed from previous years and had the addition of a street food market area which is good but still the quality of food isn't good enough for the price. It was nice to wander round with a mulled wine and look at all the lights as it turned dark. We also went on a scary looking ride but had to pay £9 and it literally lasted 2 minutes! Fuming - what a rip off! Not sure if the rest of the rides were this expensive or if we got unlucky. I also couldn't find the nik nak stalls which I love perusing! I will be back year after year as it gets me in the festive spirit (until I get so frustrated with the queues) and is a nice place to meet up for a drink with friends but I think it needs some improvement! This year I was hesitant to visit Wonderland again, since it is such a mainstream, busy December hangout, but gave it another go anyway and I was pleasantly surprised. The Bavarian Village was given an update and it is much larger now. At first I was slightly put off by cheesy songs sang by a guy on a main stage inside, but after half an hour, with cider in your hand, you cant help but sing along to Robie Williams Angels and have a German Bratwurst! I didn't have high hopes for Winter Wonderland but I loved it. It's been about 4 years since I've been and I can't believe how much it's grown. I found it prohibitively expensive when I went years ago so I went with the intention not to spend any money and I didn't. I walked around and looked at the lights and the stalls and soaked up the atmosphere. I found the atmosphere inside the Bavarian bar absolutely brilliant. There was a band performing popular pop sounds like Backstreet Boys and ABBA and everyone was singing along and dancing in the aisles. There is plenty of food and drink around to buy although I imagine the price will make you cry. I did notice that you can souvenir mugs with the beer as well which I thought was cool and judging by how many of th I saw other people thought the same. I think there is certainly an element of tourist trap to Winter Wonderland but it's in the heart of central London so I'm not surprised. You don't have to spend any money if you don't want to and it's a wonderful, if crowded spectacle. Visited Winter Wonderland last Wednesday night, somewhat begrudgingly having been last year. Actually, when we arrived, I was pleasantly surprised! It seems to have grown massively and as such isn't so crowded - maybe this was due to going on a Wednesday night rather than a busy Sunday afternoon but the sense of freedom & lack of barging through crowds made the whole experience much more pleasurable. My main piece of advice would be to take cash with you beforehand - the ATM's in the park fleece you with a £2.99 charge to get cash out! 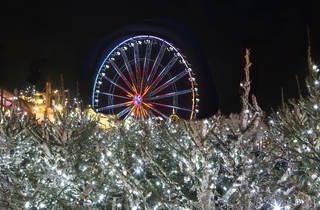 Think that Winter Wonderland is a Christmas must go in London. Even for me that am not that much into the attraction (am easily scared with it) but some of friends tried and sayd was amazing. There is also a market and some place to grab some food + mulled wine. If you're into tripping over prams and shelling out loads of cash then this could be just the experience for you...bah humbug, the kids will love it! - It's expensive if you want to do the rides - The big ones are around £8-9 a pop. - There is a big hall within the village with live music - If you like cheese you'll be in here all night! Suprisingly fun and as the night progresses the more people start singing along. - Kids loved it, but would be great for a date night. .
- Avoid the Ice Kingdom - massively over priced! So much potential in this place which is spoiled by overcrowding and exorbitant costs. It would be better to charge people to get in and lower the costs once inside. If very busy then it's inadvisable to go with small children. It starts to look a lot like Christmas! Winter Wonderland is always a rituals around Christmas. Even if you hate the crowd and the buzzing attractions, you always end up having a beer at the Bavarian village or having a Belgian hot chocolat full of marshmallows.This year display is different than the other years. There is more space between the attractions and the christmas market. Winter Wonderland in three words: massive, enchanting and busy. I've visited Winter Wonderland every year and I've always have enjoyed myself. The ice rink is huge as is the arrays of eateries and pop-up stores where you'll can find something truly unique to take home. There's games aplenty where you can win prizes, activities and attractions keep the the little ones busy such as Santa's grottos and the lights are mesmerising. Overall, something for everyone in the family. I especially loved the Bavarian Village where you can tuck into some German bratwurst, wash it down with a certain German tipple and listen to live bands on stage inside the warm tent as you tuck into your food. I also liked that Mr Fogg's, a popular speakeasy bar, has made an appearance this year. Having said all that, Winter Wonderland is not perfect. It's absolutely massive and I always feel like I'm missing out on something. I felt overwhelmed and on busier nights, I can see it heaving with people which others might not mind, but isn't really my cup of tea. Also, and this is entirely personal preference, I like quirky things and I don't see enough of it inside Winter Wonderland. I highly recommend visiting on weekdays (obvs) and try to avoid visiting over the weekend, especially once the school holiday Christmas begins. Winter Wonderland is a great place for all the family and there's not many negatives you can say here. But for me, and this is just personal preference, I prefer something a bit smaller, a bit more local away from central London and a bit more quirky. I went a couple of days ago, and it looked like a zombie apocalypse. Overpriced food, many don't accept card (it's full of ATMs which will charge you with almost £3 just for withdrawing). 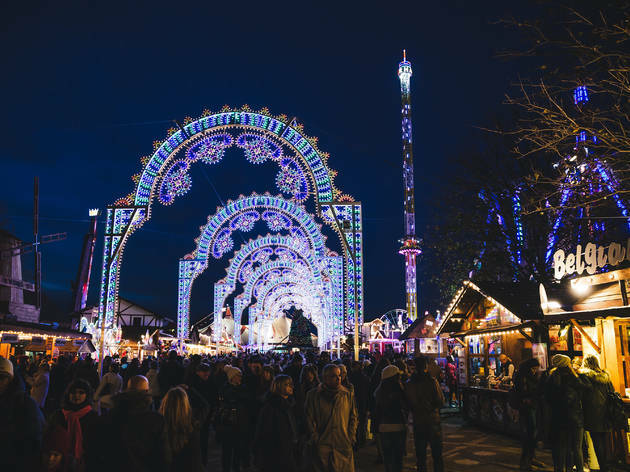 Every year, from end of November till start of January, Hyde Park is transformed to a huge festive Christmas village: "Winter Wonderland. Imagine a huge area being totally under Christmas spirit. As soon as you have plenty of cash (cash points can get quite busy in the evenings), you can spend the whole day here! Both for adults & children : ) Head to the Bavarian village for German food, mulled wine and crazy German djs on karaoke! Try any kind of food you can imagine & freshly made churros with sugar! The huge observation wheel is a bit expensive (7£) but there are so many other rides/rollercoasters/Zippos circus/ice-skating to try during your stay. Most of them are not cheap at all and you can easily find yourself lost in counting the left-over money, but definately you will enjoy it. Gloves and warm coats are highly recommended! I'm a bitttttt of a Christmas fiend so I love my annual trip to Winter Wonderland. Yes, it's absolute carnage and ridiculously busy. Try going late ish (8.30pm onwards) and there will be less children around, and of course weeknights are quieter. I love the big bavarian beer hall - a lot of fun and easy to while away a night toasty warm in there. Love the food stands, outdoor pubs with mulled wine and of course a drunken ride on a rollercoaster. Everyone calls it a monster, but it's quite a nice monster, at least. This a yearly thing for me and I love it. Yes attractions are fairly overpriced and it’s crazy busy, but this is London! You also don't have to spend much to enjoy it. 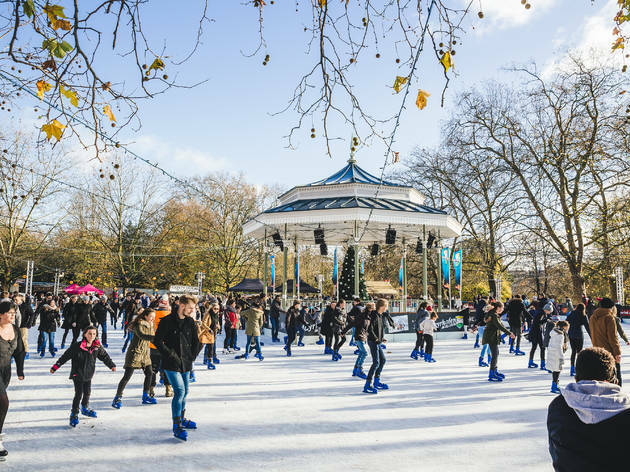 Winter Wonderland is one of the most enjoyable, free family friendly events and there’s so much to do. It’s open every day (except Christmas Day) but the best time is in the evening! 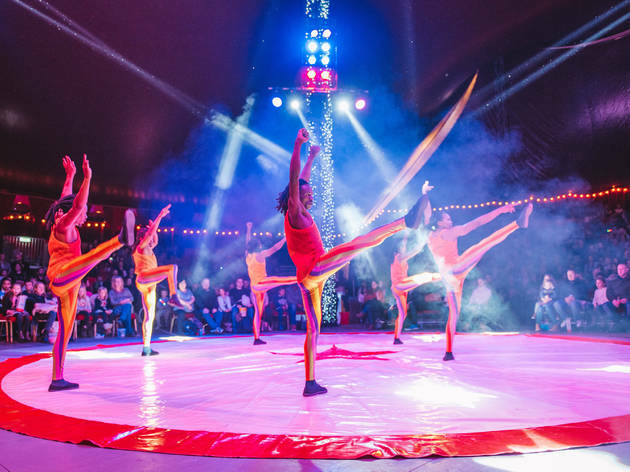 Head to the Ice Bar, watch Zippos Circus, ice skate, visit Santa’s Grotto, go on fairground rides and play games, listen to live music or simply wander around the market stalls drinking hot chocolate. Book tickets in advance for main attractions to avoid disappointment. Nearest stations are Bond Street, Green Park, Knightsbridge, Marble Arch and Hyde Park Corner. I think Winterwonderland is one of those places you either love or hate. I went there with very little expectation and was pleasantly surprised by the number of different things to do there. 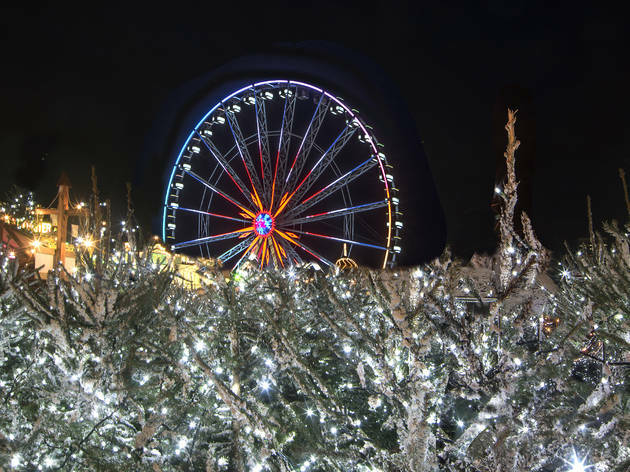 The rides are a little on the pricey side, but if you are in the moody for some festive fun, some luke-warm mulled-wine and lovely atmosphere then I think it's a pretty good option! Winter Wonderland, or maybe not. Your experience of this event is directly related to the luck you're having the day you go. It has inevitable charm and is very well made, unfortunately it is usually uncomfortably crowded. The rides are very colorful and picturesque, but unless you want to spend an insane amount of money it would unwise to ride more than 3 of them. I only went on one and can't say it was worth it. It is also a great place to go on your cheat day since its absolutely filled with fatty and inevitably delicious food. Overall I would suggest going as it is free and makes for an interesting and different evening, but do not expect the image that is sold by the advertisement as its not as 'wonderful' as it claims to be.